An elegant striped king size duvet cover with a stripe of floral detailing in a lovely lavender colourway. This bedding is perfect for creating a lovely neutral and natural look in your home. Coordinating items available. Includes two pillowcases. An elegant striped king size duvet cover with a stripe of floral detailing in a lovely natural colourway. This bedding is perfect for creating a lovely neutral and natural look in your home. Coordinating items available. Includes two pillowcases. 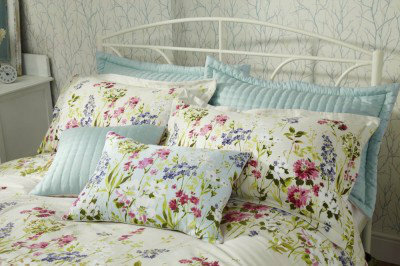 An elegant striped single duvet cover with a stripe of floral detailing in a lovely denim colourway. This bedding is perfect for creating a lovely neutral and natural look in your home. Coordinating items available. Includes pillowcase. An elegant striped single duvet cover with a stripe of floral detailing in a lovely lavender colourway. This bedding is perfect for creating a lovely neutral and natural look in your home. Coordinating items available. Includes pillowcase. 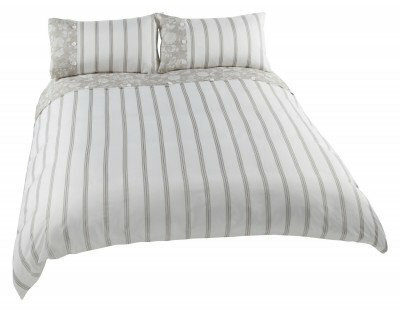 An elegant striped single duvet cover with a stripe of floral detailing in a lovely natural colourway. This bedding is perfect for creating a lovely neutral and natural look in your home. Coordinating items available. Includes pillowcase. 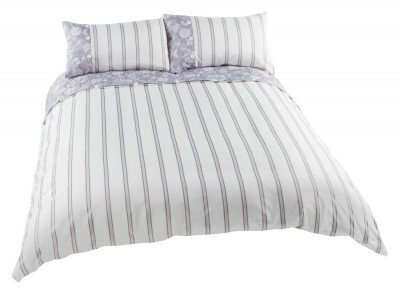 An elegant striped super king size duvet cover with a stripe of floral detailing in a lovely lavender colourway. This bedding is perfect for creating a lovely neutral and natural look in your home. Coordinating items available. Includes two pillowcases. An elegant striped super king size duvet cover with a stripe of floral detailing in a lovely natural colourway. This bedding is perfect for creating a lovely neutral and natural look in your home. Coordinating items available. Includes two pillowcases. 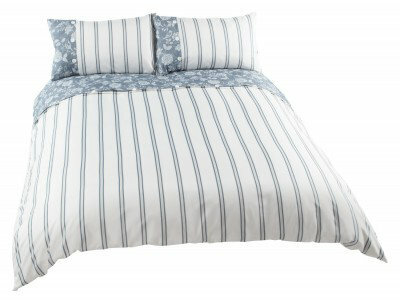 An elegant striped super king size duvet cover with a stripe of floral detailing in a lovely denim colourway. This bedding is perfect for creating a lovely neutral and natural look in your home. Coordinating items available. Includes two pillowcases. A gorgeous cream double duvet featuring a stunning floral design with a hand painted effect ideal for creating a pretty vintage interior. Pillow case included. Total duvet size 200 x 200cm. A gorgeous cream double duvet featuring a stunning floral design with a hand painted effect ideal for creating a pretty vintage interior. Pillow case included. Total duvet size 230 x 220cm.